False alarm guys, I am still technically an Always Single Lady because I'm pretty sure I can't have a boyfriend who already has a girlfriend. A couple of weeks ago, a lady contacted me on Facebook accusing me of taking her man out on a date. I've been on many online dates the past six months so I had to ask her who her boyfriend was. She told me his name and - oh darn, her boyfriend had been telling me he's my boyfriend for the past 6 weeks. Wow. 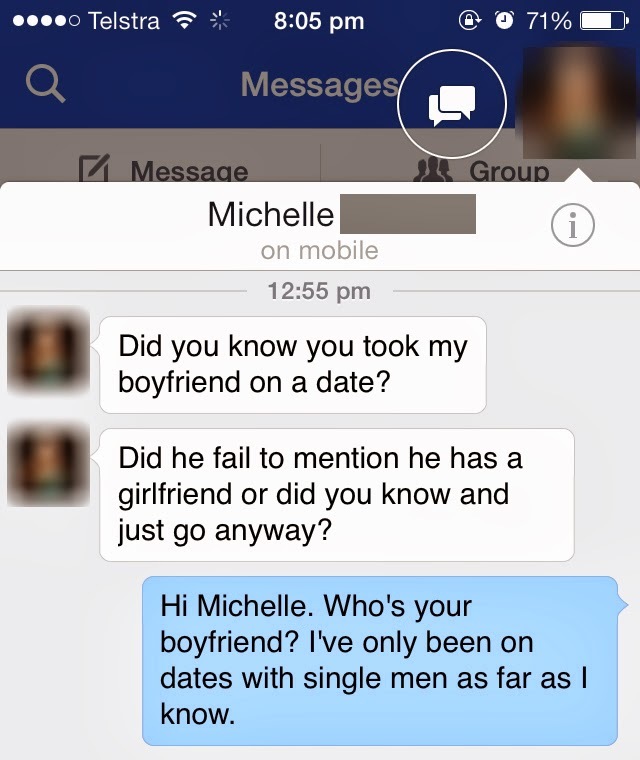 Epic, huge online dating fail. I should be angry and outraged like my girlfriends but I'm more baffled and confused than anything. ...How did I even do that? I'd heard of a friend of a friend who unknowingly had a one night stand with a married man she met online dating. Understandable. But unknowingly starting a whole relationship with a taken man? Wowee, guess I really do give 110% to everything - including failing at life. Sorry to my Phamly who've been given false hope that I wouldn't end up the single cat lady they'd have to invite to major Phamly events. Looks like I'm still destined to give their children allergies from all the fur stuck in my clothing and hair at Christmas and Phamly Birthday Month. Tune in next week for the latest chapter in The Misadventures of Jade Pham. What will I do next? It'll be hard to top this but I'm sure I can do it if I try really hard.